Visit the Christmas shop at our local garden centre, it's always so magical. Find the perfect balance between posting here and on The Book Journal. I completely underestimated the amount of work it would be to start a second blog but I know I can make it work, somehow. Donate some books I won't re-read to the charity shop & pass along some unloved products to family. It's something I've been slowly doing throughout the year and I'm quite keen to live within a more minimal space. It's a real balancing act because the desire to to try new things and read new books is something that I will always have, but I think I'm getting there slowly. Try to use my time more wisely. I'm definitely guilty of spending a little too much time doing nothing in particular when I could be doing something productive. 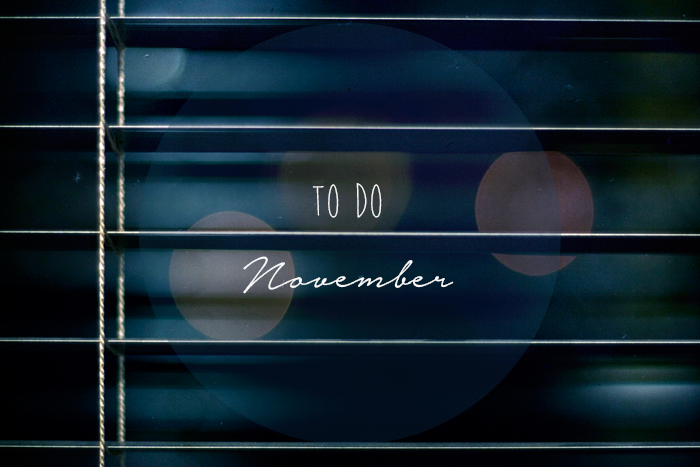 Do you have any goals for November? I am joining you on the 'use time more wisely' part. I need to hand in the first draft of my Bachelor thesis in a month and I am still wasting a lot of time, whoops! I really should start analysing my data now. My main goal this month was to get most of my Christmas shopping done, which I'm pleased to say is almost accomplished! Inspiring post :) I agree with you, I also need to spend time wisely and stop procrastinating ! I honestly have a lot of free time that I use to do Nothing while I could do something productive.. I agree with donating things! I got rid of a load of stuff recently and I felt so much better knowing it wasn't cluttering up the house! I definitely need to pass a bunch of books/trinkets on to the charity shop and I really need to spend my time more wisely! My procrastination gets out of hand this time of year. Good luck with getting through this list! nice list, i need to make one too. I totaly agree with the last one. Creating a more minimal space is on my to-do list for this month as well! I started with my wardrobe and I'm now working through my makeup. Read more! I can't keep using money and lack of time as an excuse, I need to hit up my charity shops more and ask friends & family for their unloved books! I wish we had more charity shops, which are like the ones in the UK, here in Vienna. We have a lot of charity shops for fashion or second hand furniture, but not a lot for books :( When I sort through my stash of books, they usually end up in my friends appartments or a coffee place where you can donate books to. It's good to know that they find another home (does that sound weird?). Fair play to you for planning your month ahead, being organised and motivated. Time managing can be quite an ordeal sometimes! I liked this list, good job!